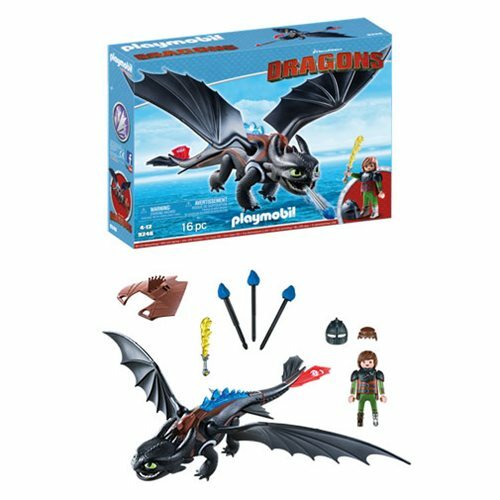 Shopping for How to Train Your Dragon Action Figures? Take a look at our huge selection of Pop! Vinyl Figures, Action Figures, Statues, Key Chains, Mini-Figures, and Construction Toys! Join in all the action with this How to Train Your Dragon Hiccup and Toothless Playset! Toothless can shoot a blue fire dart from his mouth, keeping his enemies at bay. With illuminating back spikes, Toothless and Hiccup will do whatever it takes to protect Berk and its dragon friends. This set includes Hiccup, Toothless, blue fire dart, flame sword, helmet, and other accessories. Requires 1x "AAA" battery (not included). Ages 4 and up.